Through an “alternative Christmas message” broadcast on British television (“alternative” as in, a message other than the Queen’s official one) and a Washington Post interview, Edward Snowden reveals his immaturity, paranoia, irrationality and utter lack of perspective. I can’t find an embed code for the full video, but here’s a link to it. So… according to him… a cellphone, a private possession that you are in no way required to own, certainly not by the government, a thing you can throw away the moment you want to drop off the grid, is somehow worse than being watched and listened to 24 hours a day by a malevolent government that does so for the express purpose of controlling your thoughts, a government that has reshaped language itself to prevent you even from being able to form thoughts that are not to its liking. No, we have learned nothing of the kind. I have seen nothing from his “revelations” (although I give him props for not congratulating himself, but using the relatively passive “we learned”) that indicates that either this government or any other is doing anything at all that comes anywhere close to “watching everything” I do. There’s apparently a record of phone calls I have made, and everyone else has made. Not the content, but who we called and when and for how long. A record that doesn’t even begin to be the tiniest, most hesitant intrusion on my privacy unless there is something about the pattern of my calls that draws attention to them. My own privacy is protected by the sheer volume of data of which my calls form an infinitesimal part. I have no reason to believe that this or any other government has taken the slightest interest even in this tiny corner of my life — whom I have called and when — which is a drop in the ocean of “everything” I do. A child born today will grow up with no conception of privacy at all. They’ll never know what it means to have a private moment to themselves, an unrecorded, unanalyzed thought. Really? Golly, I’d certainly like to see a little bit of evidence to back up those wild assertions. I’m even going to be charitable and ignore the number disagreement between his “a child” and his use of “they” and “themselves.” First, it would help if he had any evidence whatsoever, any reason at all to think that this hypothetical child would never know a “private moment.” I see zero reason to believe that. As for “no conception” — well, that takes us far beyond lacking the experience of even a “moment” of privacy. In fact, only in an Orwellian universe — given its careful paring of unacceptable thoughts from the language — could a child lack such a conception. As for “an unrecorded, unanalyzed thought” — what reason do we have to believe that this child’s very thoughts would be recorded and analyzed, much less all of them? The only thoughts being shared with government, to my knowledge, are those we choose to make public through social media or other means. Or over the telephone, in which case the only way the goverment hears these thoughts is if its traffic analysis has produced probable cause for a specific subpoena to listen to a specific individual’s calls, which will never happen to far, far more than 99 percent of the population. And I say this on the basis of what Snowden himself has revealed. And that’s a problem because privacy matters. Privacy is what allows us to determine who we are and who we want to be. I’m not going to respond to that, because I don’t even follow what he’s saying. I thought “who we are and who we want to be” were things that were determined by a combination of unavoidable circumstances and choices we make. Perhaps privacy plays a key role in that, but he neglects to explain how. It’s just one of those pronouncements that probably sounds profound to people who are predisposed to agree with him, and puzzles anyone else who actually thinks about it. End mass surveillance, and remind the government that if it really wants to know how we feel, asking is always cheaper than spying. His tone indicates he thinks this is a real zinger. I find myself marveling. So… that’s what he thinks NSA collection and analysis of metadata is about — finding out how we feel? What has he or anyone else disclosed that even comes within the same galaxy of indicating that? Gee, I kinda thought it was oriented toward finding out whether certain communications are happening between certain individuals, with an eye to catching warning signs not of feelings, but of the likelihood of certain actions. I mean, seriously — can anyone show me a link to a single report that would make any reasonable person think that any of these government programs are aimed at taking our emotional temperatures, or our opinions? But thanks, Edward, for the Christmas wishes. Although I must say, I think the Queen’s made more sense. But then, she’s a grownup. People, can you just chill a bit over court nominations, please? This entry was posted in Books, Intelligence, Marketplace of ideas, Perspective on December 26, 2013 by Brad Warthen. I agree completely with your thoughts on Snowden’s latest pronouncement. My wife and I were discussing this same issue this morning at breakfast. Neither of us have any concern that the NSA has data files that contain our phone number and the recipients of our calls. Our data in this regard are certainly mundane and benign. As you state, the NSA is looking at calling patterns that may indicate something that could be related to some type of terrorism. I would think that to do this effectively and vigilantly they need masses of telephone number links. It is true that we don’t have the overall “privacy” we had a generation and more ago. But, for the most part, we have voluntarily allowed this to happen by the choices we have made to use credit cards, purchase goods online, and engage in social media so that we reveal who we are, where we are, and what we are doing at any given time. Unfortunately, we live in a world where many nations and groups would like to do the United States real harm. We’ve seen a horrible example of that happening twelve years ago. I believe that our government should be ever vigilant to prevent any such future incidents. 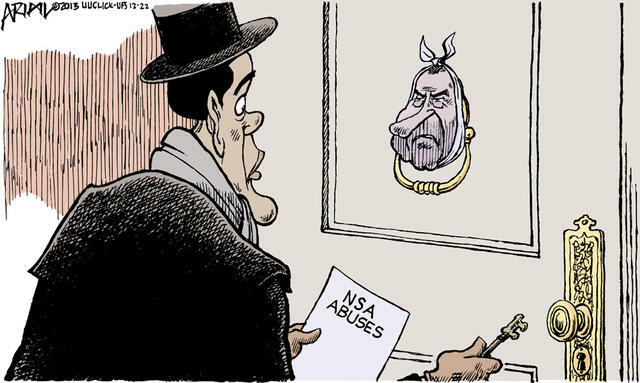 If you feel this way, and I do, too, what is the problem with shining sunshine on what the NSA is doing? We should “own”what we do. us harm will be able to take countermeasures and thus minimize the effectiveness of what the NSA is trying to do. I think there needs to be considerable covertness to enable the NSA to ascertain what our enemies are doing without them knowing how it is being done. I think you overestimate our enemies. Perhaps you’re right. What troubles me, however, is that none of us knows the scope of what our national security people know, from the President down through all the agencies involved in the operations that gather and assess information about terrorist groups and rogue nations (North Korea as an example). It may be that I overestimate our enemies, but as an average citizen concerned about the security of his nation, I guess I would lean toward overestimation rather than underestimation. If you have the capacity to attempt that, why not rank citizens as a R-120 with a capacity for rationality of 6 or an I-510 with a desire for stability of 9 and see where the troublemakers line up in your index (and why and what caused immediate shifts in their behavior)? I’d imagine dating sites and background check services have already invested millions in stuff like that. From there the big question is when they invite the right director to lunch and pitch it at the right price. What salesman would avoid getting that contract? RSA Security weakened the integrity of their product for a measly $10 million at the NSA’s request, a quarterly bump that cost them $65 million in lawsuits. I bet I could get OkCupid to turn over a personality profile of every lonely person who would likely sympathize with the Earth Liberation Front and inject a whole pile of new questions seeking interesting answers for like $500K (and I can easily imagine the FBI has already done it). The only big risk in assuming all of this is that I’ll be called a crackpot, but why not? Better to be called a crackpot today than to be called a naive doe-eye who didn’t assume the obvious tomorrow. If our government was nearly as malevolent as Snowden imagines it to be this blog would have long since been shut down, and many of us would have had a personal visit from the thought police. I appreciate his concern for governmental intrusion, but the only word I can fathom that adequately defines his acts is treason. Since he has chosen to run rather than deal with the consequences of what he has done, I doubt the nobility of his motives. It’s hard to maintain an heroic stance when you’re running away. I’m aware that he claims to have even more information that he can divulge; however, since our military and intelligence forces presumably know what information he could have, and are taking steps to limit the damage Russia may be a good place for him. I’m sure he’ll grow to appreciate Mr. Putin’s openness, and his tolerance of divergent opinion. It’s even harder, one would think, to lecture us on transparency and privacy and freedom while being protected from American justice by Vladimir Putin. But this will be lost on his admirers…. The worst Snowden has brought to the public’s attention is how poorly people authorized to access highly sensitive information with no valid Riight to Know are being screened nowadays. Believe me, ewquivalent (to Snowden’s) security clearance were much, much more difficult to come by before Ronald Reagan left office. As to, the public paranoia Mr. Snowden has been spreading globally, one must remember that with all of his claimed U.S. invasions of oversight, he himself never appears to have been detected, much less inconvenienced, until going public. I maintain that his revelations have been financed by others, foreign or domestic, seeking to discredit the U.S. Too bad, we will never know. KF is absolutely correct about a need for more sunshine in government. Correction (in my first paragraph above): ” Riight to Know” should have more accurately been “Need to Know”. I heard his quote about “a child born today…..” several times yesterday and every time I thought – that is ridiculous and utterly untrue. As far as I know individuals are still in control of where, how, and if they choose to communicate any thought they have. Until they do and where /how they choose to communicate it will determine if it is recorded and analyzed by anyone other than themselves. I understand that facebook posts, email, and other internet communications are not private, but even those cases, I find it hard to believe that anybody is doing any meaningful analysis on the thoughts of the average child born today recorded there. Maybe I’m wrong. Maybe I should be more paranoid. As I stated above I am not concerned about the NSA (or similar government agencies involved in such tasks to discover credible threats against our country) having an interest in and spending time analyzing any content of my phone calls or other online information. Snowden went on to detail how the NSA routinely intercepts children’s letters to Santa. He revealed internal NSA documents of operation “NORTH POLE” based out of Fort Hood in conjunction with the Post Office. Operation NORTH intercepts the letters, while operation POLE feeds the text into a supercomputer that runs a secret processing matrix to spot any suspicious requests while cross referencing with the child’s behavior. Speaking before Congress, an NSA official stated “we’re looking for suspicious patterns, like children who request pressure cookers, sections of pipe, or fertilizer. The tracking of Santa by NORAD, while shown to the public, as a PR gesture, is actually a covert operation in which NORAD monitors gift delivery of Amazon.com items that show up on “flagged” letters. If Snowden’s ‘North’ and ‘Pole’ allegations you describe were true, which I personally doubt, such actions by a government the size of the U.S. would be naive, incompetent and imminently wasteful. The foregoing are all credible possibilities, however. Resting up at home after the Christmas holidays. Probably very few folks at work in state offices today. And I’m not one of them. But I will probably be ready to go back by January 2. While I don’t entirely regard Snowden as a hero he did do us a valuable service by exposing just how intrusive our government has become in monitoring our communications. That’s important to know. People seem to coming down into 2 distinct camps on this issue. There are those who don’t believe there is anything to fear from the government monitoring our information and that this is necessary to protect our safety. Then there are those who believe there is little actual safety benefit to this intrusive and potentially dangerous monitoring. I tend to come down more on the later side of this. Given the extremely rare nature of terrorist attacks against American targets it’s hard to justify a gigantic and intrusive program to battle a rather small problem. Think about it. There are probably more Americans killed by insects in a given decade than have been killed by foreign terrorists. But do we create vast and intrusive government agencies to eradicate killer bees? It really is a bit of overkill to allow our government such broad powers to monitor our lives. I say we require warrants in open court to conduct these kinds of surveillance activities. And then only for limited purposes. All he has done, with regard to this nation and its people, is harmful. And the more he speaks out, the more we see that he had no rational basis for his actions. What he has done to his country is inexcusable and contemptible.